When diving into the history of Albania, I discovered personalities that helped form the national consciousness of Albania – beginning with the early Illyrian kings (Agron, Teuta or Gent) and ending with leaders of modern Albania after 1990 such as Sali Berisha, Fatos Nano and Edi Rama. I would like to learn more – and here I start with one outstanding character, Skanderbeg or Gjergj Kastrioti who lived from 1405 to 1468. Their totem, Harry writes, was the eagle from the mountains and they called themselves “Shqiptars” or “Sons of the Eagle”. Do the Albanians still today think of themselves as the sons of the eagle, as the black eagle on red has become their national flag? (see also Skanderberg in wikipedia). Oliver Jens Schmitt wrote the biography “der neue Alexander auf dem Balkan” (2009), and he tells us that Skanderbeg’s father, Gjon Kastrioti, had to give Gjergj and two more sons to the Ottoman Court in Istanbul. Gjergj converted to the islam. His courage and military skills attracted the attention of the Sultan. Then he also received the nickname Skanderbeg (Alexander). For the Sultan he did service in the Balkan area. But when his father was killed by the Ottomans, Skanderbeg deserted and converted back to the catholic church. Also driven by the need to revenge his father, he started to fight the Ottomans. In Lezhë he united Albanian princes and tribe leaders – despite their quarrels – creating the League of Lezhë under his guidance. He applied guerilla tactics and also collaborated with the Hungarian Johann Hunyadi. The League succeeded to defeat the Ottomans several tmes, though outnumbered by the Turkish army. He was also supported by Italy (Naples and Rome brought money and weapons, but Naples rivaling with Venezia also created problems). Already in the 15th century Skanderbeg counted as a hero. Not only in Western Europe, but also for the Ottomans. When they found his grave, they made amulets of his bones hoping to benefit from his courage. Skanderbeg’s uniting several tribes under his flag helped shape the national consciousness which eventually ended in the creation of Albania in 1912. Numerous street names, places and statues remind of him. Albanian and international writers have been inspired by him such as Fan Noli, Naim Frashëri, Ismael Kadare, Lord Byron or Voltaire. Vivaldi composed an opera. And with Sowjet-Albanian collaboration the film “The Great Warrior Skanderbeg” was directed by Sergei Yutkevich winning a price in Cannes in 1954 (Великий Воин). Why have I not heard of Skanderbeg before? I now ordered the biographies written by Ismail Kadare and by Oliver Jens Schmitt. 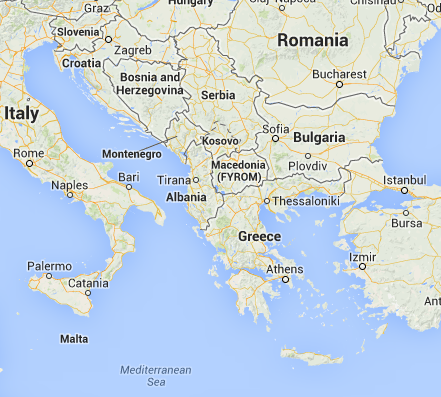 Planning of being on the road again in 2014 – Albania? Ursula asks me, whether I would like to join her and visit Albania. When 8 to 9 years old I spent one night reading the “Red Zora” by Kurt Held. Zora was from Albania and emigrated to Croatia to escape blood-vengeance against her family. Albania must be a country with tough rules, I thought, and these rules shaped Zora’s will to fight that I admired (see also the NZZ article of 2008). During the cold war, I perceived Albania as a locked garden somewhere on the Dalmatian coast. After the fall of the iron curtain I watched the hooting of the Kosovo Albanians celebrating their new nation. This is a people with commnon roots, and I noticed their will to fight that I had admired Zora for. I believe, it is a good idea to visit Albania now, as it is on the verge of change and, if the Albanians make good use of their will, the country has good chances. To understand more of Albania, I dive into wikipedia (Albania , history of Albania and Albian parliamentary election 2013). In addition I acquire the book “Albanien” by Renate Ndarurinze (Trescher Verlag 2013). I discover that the nation of Albania has been founded in 1912 or just 101 years ago, in the same year that my father was born. On May 30th 1913, the Great Powers acknowledged Albania – and May 30th is my birthday. Why have I not known more about this country? I always need structure, and this structure resonates with me: Prehistory, Antiquity, Middle Ages, Ottoman Rule ending with the first republic of Albania, World Wars and Interwar Period, Socialist Republic and Transformation towards Democracy. And these are the facts that I read from my sources. Early human traces were found in Albania, starting BC 100’000. Around BC 1000, there are settlements of various Indo-European tribes including Illyrians that are claimed to be the ancestors of the Albanians (this is sometimes controversial). The Illyrians lived in fortified settlements, ran silver and copper mines, and traded. There are Greek colonies (from BC 600) and some flourishing Illyrian kingdoms from BC 500-200 (ruled e.g. by the kings Agron, Teuta or Gent). The Illyrians had agile galleys that threatened the Romans, and the Romans fought against them. Eventually emperor Augustus succeeded to integrate Illyria into the Roman empire (BC 27). The Via Egnatia becomes the shortest road to Byzantium. When the Roman empire is divided up around 400 AD, the new border splits Albania, with the North going to the Western Roman and the South to the Byzantine Empire. Until 1200 landlords are mainly Byzantine and Bulgaria, and there is also local Progon from Kruja who rules over the principality of Arbanon for about 20 years. In 1054, the schisma divides Christianity into roman-catholic and orthodox. Northern Albania becomes roman-catholic and Southern Albania adopts the orthodox direction. In 1204, the Fourth Cruisade results in Byzantine being expeled from Albania. There are new landlords: Sicily, Naples, Serbia and later Venezia. 1267 to 1272 Charles of Anjou from Naples calls himself “Rex Albania”. After 1350, there are four family clans (the Ballsha, Topia, Muzakas und Zenebisht) leading their empires in Albania, Kosovo and parts of Epirus. It is here and now, Wikipeda says, that the Albanian ethnic group seems to surge and become a majority, based on their nomadic culture and their shared language. In 1398, the Ottomans win the Battle of Amselfeld in Kosovo and start to invade the Balkan (the Ottomans had crossed the Dardanelles in 1354 and then had steadily advanced through Greece towards the Balkan). Skanderbeg withstands the Ottomans from 1443 to 1468. He is a national hero. His flag, the black eagle on red, will be the banner of modern Albania. By 1479, all Albania is under Ottoman rule. Until 1800, there is peace in this Ottoman province called Sanjak. The districts are governed by local elites and governance is handed over within their families. The Ottomans expect taxes and soldiers. In the 17th century, the Muslims are in majority, but they have a practical relation to religion: Some would go to the mosque and then to the church to be sure, they get it right (observation of Lord Byron in 1809). After 1800, the Ottomans are “the sick man of the Bosphorus”. Two local families in Albania provide strong leaders. One of them, Ali Pasha in the south, becomes largely independent and develops the economy. The Ottomans hit back. In 1830, the commander of the Sultan in Albania invites the local leaders under the pretext to give them an award – and shoots them down. Excessive tax increases make the economy suffer. A new wave of emigration results. After 1850, the Albanian national consciousness is surging – called “Rilindja” (ri-lindja=re-birth). Rilindja is driven by the elites and spiritual leaders. It surged despite the odds of social structures differing from North to South, the odds of the non existence of one religion supporting identification, the odds of the absence of a standard Albanian language with a standard alphabet and the odds of lackig schools teaching Albanian (90% of Albanians were illiterals). Amongst the elites, the brothers Frashëri stood out. After the Turkish-Russian War of 1878-81, parts of Albania are given to Bulgaria and Montenegro. Abdul Frashëri leads the League of Prizren. At the Congress of Berlin, he ask for an autonomous Albanian region within the Ottoman empire. As he is rejected by Bismarck, he fights and restablishes the Albanian province staying under Ottoman rule. But then the Ottomans destroy the league. Around 1880, a standard Albanian script is emerging: Exil Albanians in Istanbul define “the Latin alphabet adapted to the Albanian language”. In 1887 the first school teaching in Albanian is founded and in 1908 the standard Albanian Latin script is agreed upon at the Congress of Manastir. It is in 1899 that for the first time an independent Albanian nation is proclaimed by Sami Frashëri (Abdul’s brother). Sami publishes the politicial manifest Shqipëria: “ç’ka qenë, ç’është e ç’do të bëhet (Albania – what it was, what it is and what it will be)”. The third Frashëri brother, Naim, writes the biography of Skanderberg to strengthen the national consciousness of the Albanians. After the first Balkan War (1912/13) the Ottomans are expeled from the Balkan. Albania is invaded by Montenegro, Serbia and Greece. Under this pressure, Ismail Qemali and the leaders of the Albanian National Movement proclaim the republic of Albania in Vlora. The Great Powers accept Albania in May 1913, while assigning Kosovo to Serbia to please Russia and France. Already in 1914, Albania disappears from the map and then resurrects again in 1920. Until 1939 it becomes more and more dependent on Italy and Mussolini. 1925-1939 Ahmet Zogu, later king Zog I of Albania, partially succeeds to modernize the country – with the help of Italy. In 1939 the Italians occupy Albania and Zogu leaves the country. In 1941 the Germans occupy Yugoslavia, Albania and Greece in their Balkan Campaign and create Great Albania (including Kosovo and parts of Macedonia and Montenegro). Resistence surges, led by the recently founded communist party under Enver Hoxha. He collaborates with Josip Broz Tito. In 1944 the Germans retreat from the Balkan. Remarkable: In 1944 the Germans ask Albania to arrest and hand over Jews, but their government does not execute the orders for arrest and the population hides the Jews that are in danger. Religious tolerance prevails in Albania. In 1944 Enver Hoxha and the communist party take over in Albania. Hoxha proclaims the Socialist Peoples Republic of Albania. The estates of the squires are distributed to the farmers. 1944-1948 cooperation with Yugoslavia, until Stalin expels Yugoslavia from the Warsaw Pact membership. 1948-1968 cooperation with the Soviet Union. These were the best years for Hoxha. With support of the Soviet Union, industry and water power stations are built and agriculture benefits from drying swamps and building irrigation. In 1967, Hoxha proclaims Albania to be the first atheistic nation of the world. After Stalin has died, Hoxha is not able to follow the reforms in the Soviet Union. Starting in 1961 there is less support from the Soviet Union and China’s support phases in. 1968-1978 cooperation with China. Economy decays, as the investments of the Soviet Union can no longer be supported. 1978-1990 Albanien’s solo. Hoxha is now paranoid and builds 700’000 bunkers to defend the country. In 1985, Hoxha dies and Ramiz Alia takes over. With caution, he allows for more freedom. Though Hoxha locked his country, installed his secrete police (Sigurimi), controled information, repeatedly killed whom he thought might be dangerous and installed cruel concentration camps, his achievements should also be mentioned: Forced education largely eliminated illiteracy, the university of Tirana was founded, public transportation was free (private cars were forbidden), health care improved and women’s rights were important to him. When cooperating with the Soviet Union, the economy advanced. Around 1990, the Albanians notice the changes in the Eastern Block and start to revolt – or ask for asylum in embassies. Parties and elections start end 1990: As a second party, the Democratic Party of Albania (DPA) is founded, lead by the medical doctor Sali Berisha. More parties follow. In the first elections (1991), the Communists win again, in the second elections (1992) the DPA with Berisha is the winner. In 1997, the Socialist Party with Fatos Nano takes over, and after that it is again the DPA with Berisha, until 2009. Sometimes , the elections are reported to be fair, sometimes not. The elections of 2009 are very controversial. When in 2011 a video appears on youtube showing how the vice prime minister arranges a corrupt deal with the minister of economy, the situation explodes. There are uprisings in Tirana and other cities that end with violence. The next elections of 2013 are won by the Socialists Party with Edi Rama and Sali Berisha of the DPA accepts his defeat – a sign of growing democratic maturity in Albania. Despite reforms, the economy does not really advance in the first years after 1990. In 1997 the situation explodes with the “pyramid scandal”: Investment banks had promised excessively high interest rates to the Albanians – and then went bankrupt. This leads to uprisings followed by new elections (at this point the Socialist Party takes over from the DPA). After having overcome the pyramid scandal, Albania has grown by 6 to 8% for several years.